It’s Saturday! Woot! I love the weekend, especially when I don’t have any major plans because I get to enjoy lazy days with my family. It’s also finally starting to warm up around here in Pennsylvania so I’m anxious to get outdoors. 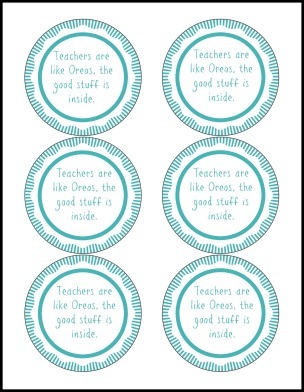 So did you know that this upcoming week is teacher appreciation week? Yup, from May 5-9. I remember several years ago when I was studying to become a teacher and I had the opportunity to teach a few classes. Although I wound up switching my major, it was a wonderful experience and it helped me appreciate what teachers do each day even more. So I created a couple of printables you can use to show your appreciation. A mason jar filled with Oreos, seriously, who doesn’t love Oreos? 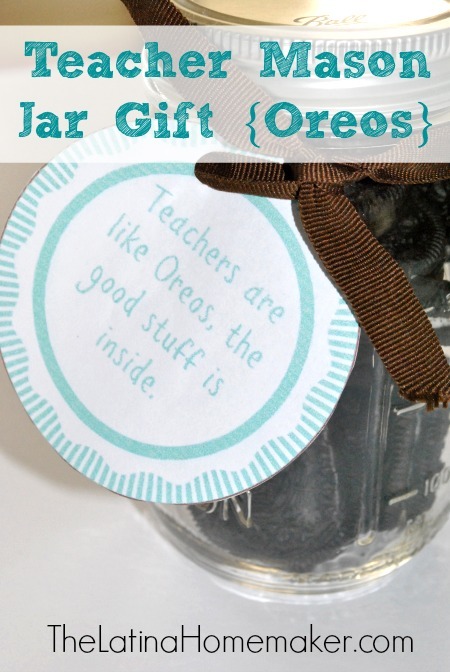 If you’re on a tight budget this teacher mason jar gift is a great inexpensive gift idea. I also suggest taking it a step further and creating a thank you card. Teachers are not told enough how much they are appreciated for their hard work and I think it’s great to remind them. To create this yummy gift. Simply punch a hole through the label, add a ribbon and tie it around the jar filled with Oreos. That’s it, easy peasy. If you prefer to make your own homemade cookies or candy just simply print out the pink labels instead. Enjoy! To print labels simply click on the images below. What a thoughtful and sweet idea.